This year I had the honor of participating as a Designer in the Portland Holiday Home Tour. I was fortunate to have a lovely, historic home to work within. 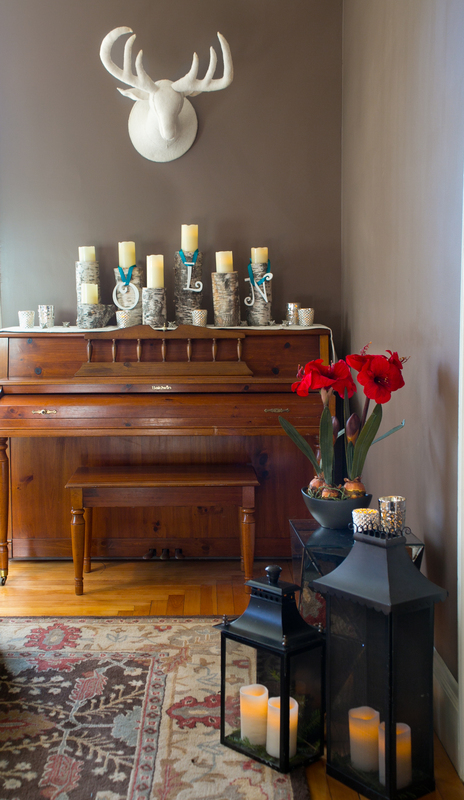 My task: turn a Living Room into a beautiful holiday space meant to inspire all visitors! I decided on a Winter Woodland theme. It was a great experience and a lot of fun! As a designer, I was asked to come in and decorate only; meaning, I am limited to using the existing furniture, rug and current paint colors. Otherwise, I was given free reign by the homeowners regarding the design. I removed furniture from the room, rearranged the layout, and brought in other pieces. The other item worth mentioning is that this lovely family with three young daughters would be living in this space as decorated throughout the holiday season. I wanted it to be beautiful, elegant for the adults, warm and inviting to all, and definitely family friendly! Please take a look at the before and after photos and let me know what you think. 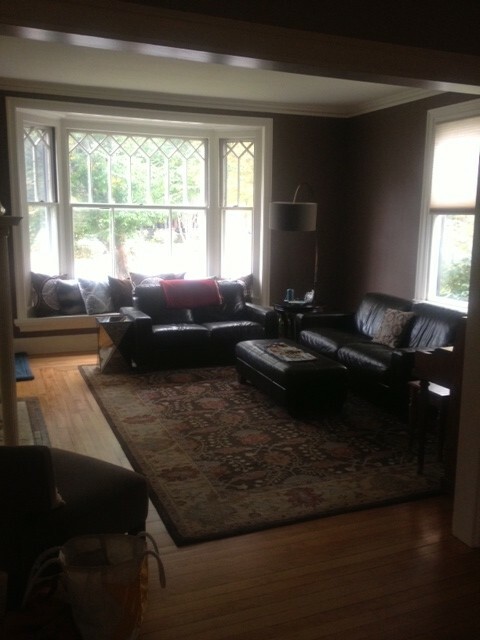 I removed the leather loveseat and ottoman and moved the rug closer to the fireplace. 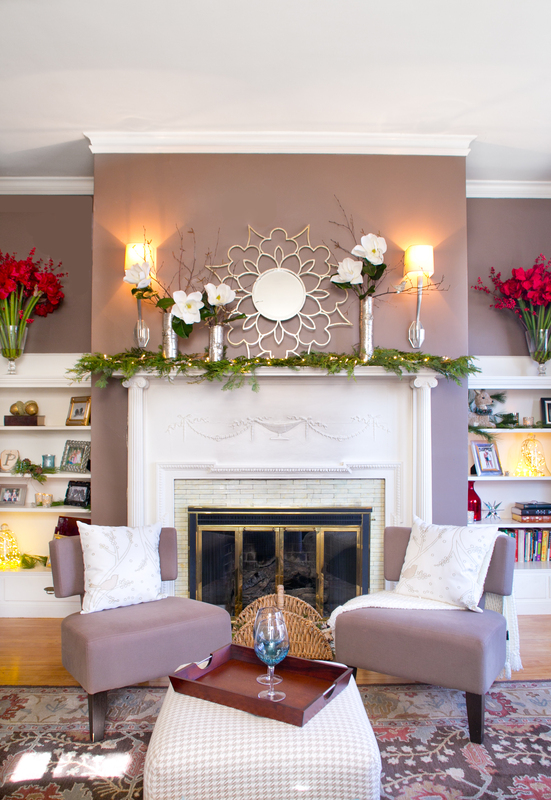 Bringing in a pair of matching chairs and flanking them on each side of the fireplace created more balance. A square hounds-tooth ottoman is more suitably scaled for this space and helped to brighten the room. It also serves as a place to sit in a pinch or to set a tray for holiday cocktail parties! Opening up the window seat area and placing a table in front makes it feel more a part of the room. Red silk drapes frame the window beautifully and help to soften up the space. Placing the tree in the corner draws you in for a better look. And who wouldn’t want to go get a closer look at the snowy owl perched near the top. 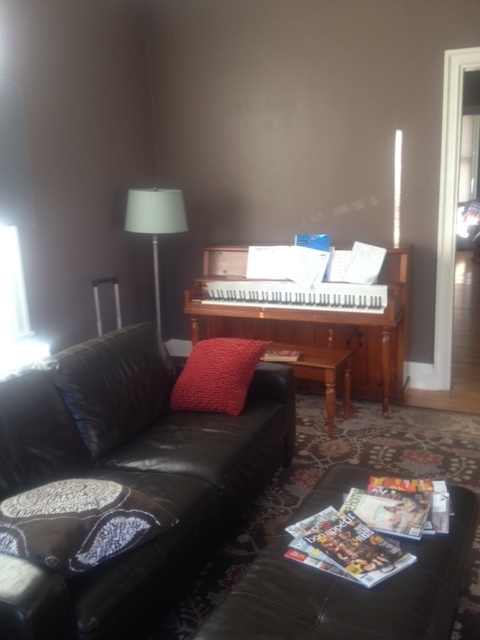 The piano was turned and placed on a different wall. A birch tree limb was the source for the pillar candle holders (A wonderful friend generously donated the limb from a tree on her property.) These battery operated candles even work on a remote! A bit of silver with the votives adds sparkle to the natural birch. I hung the initials of the three girls to help personalize the space. And last, the felt deer head. I absolutely love it! It adds a little more to the Winter Woodland theme, and is just plain fun. This fireplace was gorgeous to begin with. I decided on a simple silver and winter white design to enhance the existing characteristics. 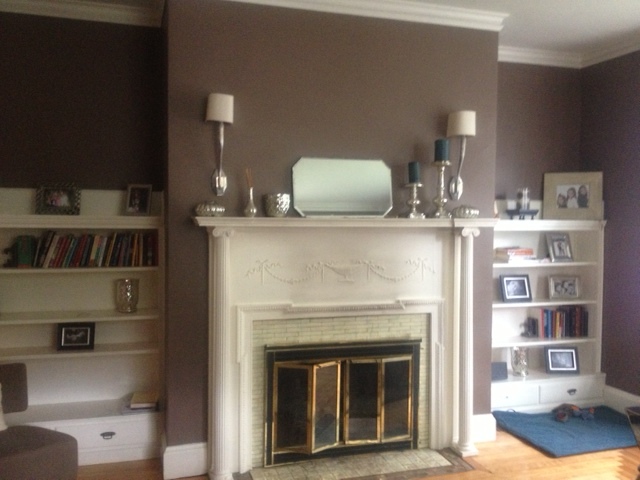 A beautiful antiqued silver mirror is the focal point. The silver birch vases, magnolia stems and birch branches add a touch of beauty and elegance set among the natural pine branches and beaded lights on the mantle. The built-in bookcases were made over using the homeowners’ photographs and books. 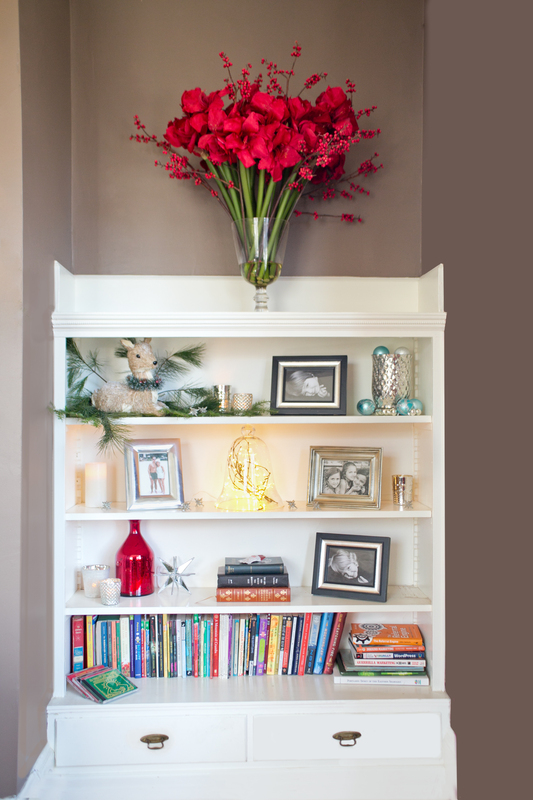 Gorgeous red amaryllis arrangements added the necessary pop of color, height and drama. 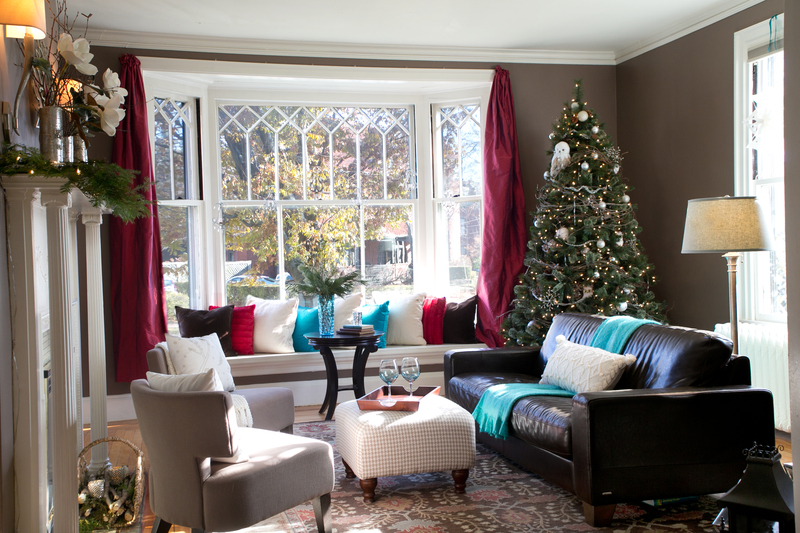 Holiday accents were added throughout to tie in the silver, red and turquoise color palette. Mini lights were wrapped around birch branches and placed under cloches to add a little sparkle and light to otherwise unlit spaces. I hope you enjoyed seeing the transformation! Please feel free to comment. Gallery | This entry was posted in Events, Holiday decorating, Living Rooms and tagged Decorating with red and turquoise, holiday home tour, Holiday living room, holiday mantle, Living Room, mini lights, silver and birch. Bookmark the permalink. Lisa, your holiday make-over looks amazing! Great job and I look forward to seeing the end result of your master bedroom retreat! Looks fantastic, Lisa! Great job and what a lucky family! Thank you Rachel! I’m glad you enjoyed it. of it and i also have you book marked to check out new information in your website.